On our drive, we talked about fishing, and with his wild imagination, my son shared with me his concern that we would catch fish so large that our poles would break under the weight. So we stopped along the way and picked up an extra rod. You can never have too many. We pulled into Wilson and arrived at our hotel, the Midland Railroad Hotel, a National Register-listed property that I think is a must for any historic hotel "collector." It has been restored and appointed with craftsman style furnishings and provided a very comfortable stay. Our bellies were starting to growl, so we headed to Made From Scratch, a quaint diner just a couple blocks from our hotel. The dining room was full when we arrived, but Karen, one of the servers, quickly showed us to an open table. She explained that with it being fourth of July weekend, a lot of people were at the lake and they like to come into town for a home-cooked meal. Since Wilson is called the "Czech Capital of Kansas," I wanted to know about the local favorites, and another restaurant staffer, Jenny, told me that two types of pastries - bierocks (meat and cabbage-filled) and kolaches (fruit-filled ) are very popular, as are chicken fried steak, smoked meats, "and pie - she (owner and baker Jayne Reilly) bakes them fresh every morning, and we have all kinds." I didn&apos;t want to be rude and go straight to dessert, so I ordered a bierock. It took me back to the first one I had when I was about nine years old and attending a wedding in Western Kansas. At first I wasn&apos;t too sure - cabbage, after all!?! Then I took a bite and asked for two or three more. The Made From Scratch bierock was just as good as Aunt Rita&apos;s with its tender dough and well-seasoned ground beef and cabbage. My son enjoyed some chicken fingers (have I mentioned he hasn&apos;t yet developed his mother&apos;s adventurous palate?). I wished my husband were with us so we could each order a different pie and steal bites from one another, but with no refrigerator in our hotel room, I had to choose one - and only one pie. The words from one of my favorite movies came to mind, "Choose, but choose wisely..." That day&apos;s offerings included coconut cream, raisin cream, Dutch apple, gooseberry, mixed berry and rhubarb, all "made from scratch" by Reilly, and a decadent-looking peanut butter cheesecake crafted by the restaurant&apos;s new baker/cook, Josh, who studied culinary arts at Kansas State University. I chose the rhubarb (another childhood "discovery"), which was served with a huge scoop of homemade vanilla ice cream on the side. My son opted for the ice cream with no pie on the side. Although I love pie, for me it is more about the filling than the crust, and I often leave the back end of the pie on the plate. But Reilly&apos;s crust was so delicious, tender and flaky - I ate the whole thing. The rhubarb filling was sweetened enough to enjoy, but still tart enough to have a little bite. I texted my husband, "if we&apos;re ever driving through here again, must stop for pie!" Our appetites satisfied, we drove out for a sunset look at Wilson Lake. Sadly, it was too windy to fish. But after a restful night at the hotel, we headed back home and stopped off at Milford Reservoir, where my son caught his second bass ever. Glad we picked up that extra pole!. - For big appetites, hit up the buffet, offered Friday, Saturday and Sunday, and featuring home cooked favorites such as chicken fried steak fingers, mashed potatoes and gravy. 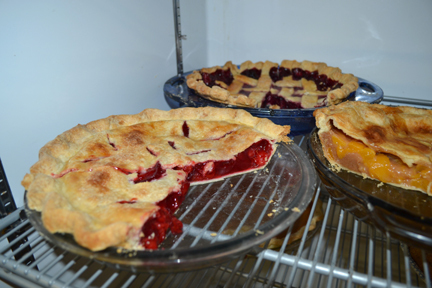 - Pie: pick your favorite flavor, and you will not be disappointed! Teresa Jenkins is all business during the week, but on the weekends, she, her husband and 12-year old son enjoy loading up the car and hitting the Kansas byways in search of good food and the great people who prepare and serve it. Her favorite cuisines are Mexican, Italian, and "anything with flavor!"